rule on the latter issue (see discussion here). courts trust the judgments from the State in which the division of powers is blurred? mutual recognition of judgments, in the context of detention conditions. mechanism of recognition is possible only if the decision on the basis of Art. 7 TEU is taken (§§ 71 -73 of LM). person subject to EAW pleads it. the mechanisms for the protection of human rights within the EU legal system). the court unfolds in three parts. are placed on the principles of mutual recognition and mutual trust. effect to the EAW (§ 59). is required to make an assessment of the risk in the individual case (§ 60). executing authority should pass to the second step. factual context that forms the basis of the European Arrest Warrant. the European arrest warrant” (§ 78). assess the LM judgment in an unequivocal way (see the debate on Verfassungblog). detailed and disconnected from the ECHR’s. this of a constitutional court of the EU. the Charter can have this effect. proceedings to which the requested person will be subject.” (§ 74 of LM). 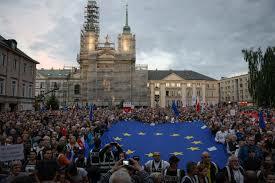 judges in Poland the source of the problem is the will of the governing party. not have dared to follow the Hungarian path.